The DeKalb Zoning Code update meeting of May 20, 2013 was well attended, and included representatives from many area neighborhoods. The meeting was led by Andrew Baker (interim director for planning and sustainability), Marian Eisenberg (zoning administrator) and Commissioners Jeff Rader and Kathie Gannon. The presenters emphasized that this is a "total re-write" to match the zoning code to comprehensive County planning documents; encourage higher density development in areas that are already zoned as commercial (this in response to public requests that residential areas be protected); redevelop underutilized space; and improve "predictability"--meaning, that people should have access to a County map that clearly highlights what uses are allowed in a given area so they can factor that information into personal and financial decisions. 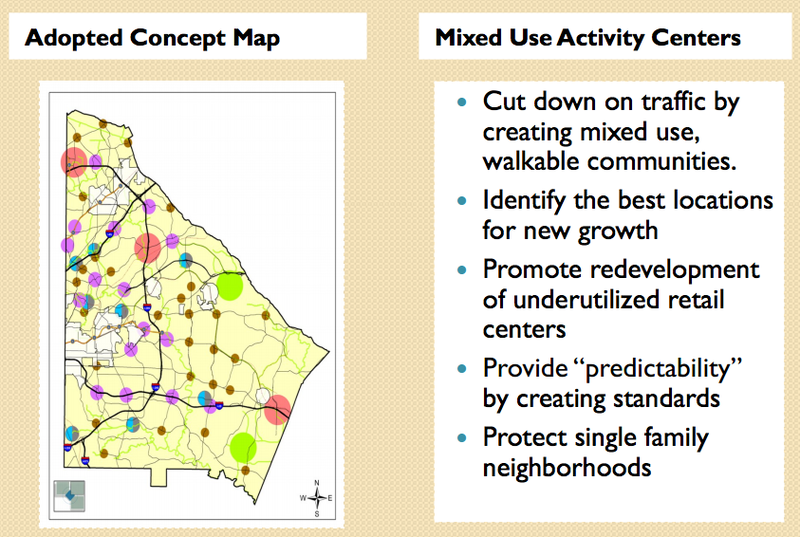 Upon approval of the new zoning code [see previous MANA summary here], the Planning Director will become the "interpreter" of the code, and the new code will supersede any conflicting information on Chapter 14 of the DeKalb (Land Code Ordinance). there was a comment about who is considered an "aggrieved party" and the answer was that individuals can be aggrieved, neighborhood associations cannot. an audience member asked about administrative variances. Requests to change density will always fall under re-zoning. The interaction between administrative decisions and the new criteria will likely lead to the development of new benchmarks for appeals. Commissioner Gannon noted that the schedule for adoption suggests the code will be voted upon at the May 28 Board of Commissioners meeting. However, the Commissioners are strongly encouraging citizen involvement and comments on the plan, and Commissioner Gannon said they would probably defer the vote and allow a couple of months to finalize the existing zoning code draft. As of today, the appointment of Andrew Baker as director of planning and zoning remains on the May 28 meeting agenda, and so is a resolution to increase storm water utility fees, but a vote on the zoning code is not in evidence. 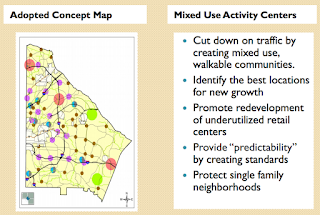 For suggestions & comments, contact Marian B. Eisenberg, Zoning Administrator, 404-371-4922.